Sign up for Camp this Summer! It may be cold outside but the time is now to register your child for the time of their lives at Goldman Union Camp Institute (GUCI) this summer. Registration is very strong this year and cabins are filling up with happy GUCI campers, so you will want to send in your application and $75 deposit soon in order to reserve your spot. I attend GUCI as a Rabbi on Faculty for the first two weeks of camp each summer for a reason. GUCI is a place where Jewish lives and Jewish Identity begin in a wonderfully supportive and spirit-filled way. 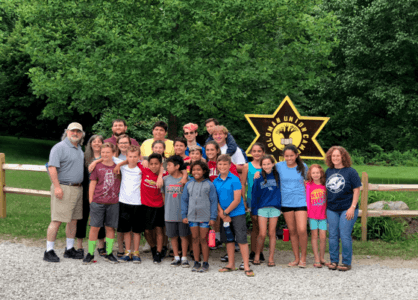 Every summer is an adventure spent with Jewish friends and family learning who we are and what being Jewish can mean in our lives… and we have a lot of fun swimming, climbing, playing basketball, sharing our passion for music theatre, arts along the way. If you have not yet registered, that will be your first step toward making this dream a reality for your children. Information and enrollment forms can be found at https://guci.org or just call me to talk at (502) 423-1818. Financial Assistance is available from a variety of sources to help your camper attend GUCI this summer. The Temple has the Hess Camp Fund specifically designated for GUCI Campers, The Jewish Federation of Louisville offers further support for summer camp experience, there is a “One Happy Camper” scholarship specifically designed for first-year campers, and GUCI provided generous discounts on a need basis as well. No one stays home from GUCI for lack of funds, just give us a call and we can help you make this possible. You will find attached below the simple form you need to fill out to request campership support from The Temple. Join Rabbi Rapport and many Temple friends at Goldman Union Camp Institute this summer. GUCI is a place where Jewish lives and Jewish Identity begin in a wonderfully supportive and spirit-filled way.